The technical picture for silver spot prices remains very similar to that of gold, with silver prices pausing once again in the 17.50 to 18.00 price level once again, but ending the day marginally higher but with a deep lower wick to the body of the candle. 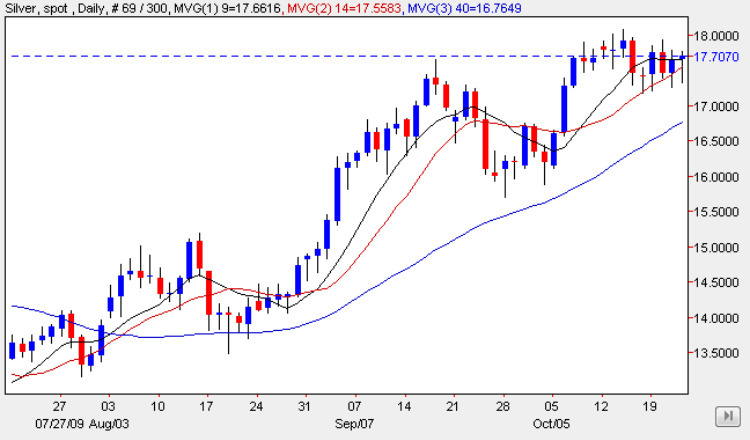 As with gold prices, this is a positive signal and suggests that we should see spot silver break higher in due course, particularly as the open of the day found strong support from the 9 day moving average adding weight to our analysis. The difference of course between the two commodities from a technical perspective is that silver is currently battling through some stiff resistance in the current price band, whilst gold is simply pausing in new high ground. However, with both commodities poised to break higher, we should see them move above these temporary pause points in due course, with spot silver breaking above the $18.50 upper resistance level and on towards our initial target of $18.8o for the industrial metal.